I was interested in this article because it looks at caregiver burden across 20 countries. It includes the U.S. – among the high income countries as classified by the World Bank – and Romania – among the upper-middle income countries (although not the other countries I’m focusing on right now – Finland and Estonia). The study looked at adults aged 50 and older who were caring for a first-degree relative with a serious physical or mental condition (a total of 13,892 people). They answered questions about their experience of different kinds of burden such as the type of tasks they did and the time it took, financial burden in terms of money spent and earnings foregone, how much caregiving affected their life, and how much it caused psychological distress or embarrassment. One of the key findings of this study is that the basic patterns (proportion of caregivers experiencing burdens, amount of time spent providing care, etc.) are quite consistent even across countries with very different economic, cultural, and service system structures. The challenges of caregiving are, apparently, global. Across all 20 countries, 36% to 43% of caregivers experienced some type of burden in their role. Between one-quarter and one-third reported time burden, financial burden, and psychological distress. A much smaller proportion reported embarrassment. On average, respondents spent 18.9 hours per week on caregiving activities with the most time (just over 23 hours) spent in low/middle-income countries and the least time (16.6 hours) in high-income countries. Not surprisingly, financial burden was higher in low/lower-middle income countries than in high and upper-middle income countries. Women reported more burden than men on all indicators except financial burden. There was a lot of variation across countries in terms of differences by demographics. In fact, the only clear and significant pattern was that women in high- and upper-middle income countries reported more psychological stress and more time burden than in low-income countries. So . . . globally family members over the age of 50 are providing a lot of care. To help put the amount of care in perspective, in high-income countries respondents reported about 206 hours per week per 100 caregivers aged 50 and older. In the U.S., this translates to approximately 3.2 million full-time equivalent older adults working as informal family caregivers and $5.3 billion a year, which is equivalent to the average annual salaries of over 130,000 U.S. workers. That’s a lot of people power and a lot of people facing significant challenges. Of course, caregiving can have its positive side as well. I just reviewed a book of poetry and short fiction about the experience of caregiving for another blog. This collection portrays the complexities of caregiving, including how the positive and negatives intertwine, in a visceral way that facts and figures just can’t. Research does suggest that a number of things help offset the burden. This includes the relationship between caregiver and care recipient before the illness; rewards from caregiving such as feeling closer to your loved one and doing something that feels important and meaningful; how the caregiver copes with difficulties; and the availability of services for both the caregiver and the care recipient. I’ll look at some studies of the more positive aspects of caregiving in the next couple of posts. Until then, have you thanked a family caregiver today? 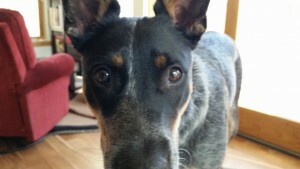 Or, how I learned yoga from my dog. I’ve been stalking my dog Loki with the camera to catch her doing Ahdomukha Svanasana (Downward-Facing Dog Pose) and Urdhvamukha Svanasana (Upward-Facing Dog Pose) because she does them so well. Sadly, I’m not quick enough with the shutter. Of course, her poses don’t look exactly like the bi-pedal versions (or maybe that’s the other way around), but I can see through her where the inspiration came from and I better understand my teacher’s instructions about lengthening. Downward-Facing Dog is good for stretching and strengthening the shoulders and the legs. It’s also a resting pose that can calm the brain and slow down the heart, although I have to admit when I first started practicing I thought this was crazy talk. 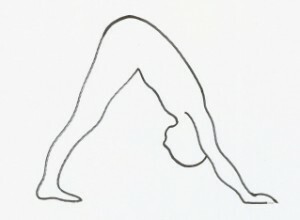 Upward-Facing Dog is a backbend. It allows the chest to expand and the whole front body to lengthen. When I do these poses I tend to think about the weight of my body on my hands and shoulders and in the case of Upward-Facing Dog the curve in my lower back. When Loki does these poses it’s clear that it’s all about lengthening. She almost floats off the floor. Her spine gets longer. She stretches so completely that there’s a little juddering motion as the energy flows up and out. Lately I’ve been trying to mimic her poses. She is no help at all. She just wants to play, but I do my best in spite of her nudges and nips. In Downward-Facing Dog, I focus less on my weight against the floor and more about lengthening upward all the way from the palms of my hands and up my legs from the arches of my feet. I try imagine my hips touching the ceiling. 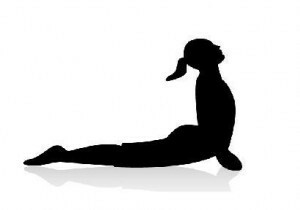 In Upward-Facing Dog, I think less about my lower back and more about curving my upper back and lengthening out through the top of my head. I’m not floating like Loki yet, but I can see how I might get there someday. 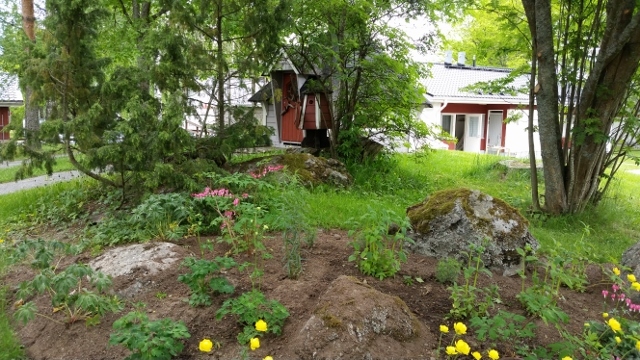 Ehtookoto provides housing and support services to older adults and adults suffering from mental health problems in the municipality of Lempäälä, Finland. It was founded in 1965 and embodies the principles of empowerment and client-centered services that we often talk about, but sometimes struggle to put into practice. It is also situated in a lovely, wooded setting with gardens, chickens, and a fire pit for summer (or winter) sausage grilling. Ehtookoto is a nonprofit association that receives most of its funding from the municipality which purchases its services. Residents pay rent and a service fee that is based on the amount of care they need. Depending on their income, the municipality may pay for some of all of this care. In that way, Ehtookoto is similar to other senior housing agencies I learned about during my time in Finland. I think, however, the level of client participation sets it apart. There is a resident and client council that meets once a month. Residents are involved in the recruitment and interviewing of new employees. Even when they were hiring for the dementia care unit, a resident of that unit was involved and asked good questions. According to the executive director, you can learn a lot about a potential employee by how they respond to the resident member of the interview team. A word to the wise future applicant: if you don’t speak to or acknowledge the resident interviewer in the same way you do with everyone else, you won’t be working at Ehtookoto. Residents are involved in various organizational development activities such as identifying and defining the values of the organization and the elements of a good home visit. The director’s office door is always open and residents are not shy about voicing their concerns and sharing their ideas. At least, not eventually. Older adults are increasingly moving to places like Ehtookoto with more physical, mental, and cognitive problems than in previous years. 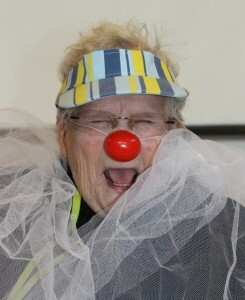 This is because Finland’s 2013 Elder Care Law dictates that older adults should be cared for at home for as long as possible and institutional care as we have known it is being phased out. Older adults are moving to Ehtookoto, therefore, from elderly care institutions or psychiatric hospitals that are being shut down or after years of having received home care. It can be a difficult transition from a setting where you are a passive care recipient to one where you have choices and can decide how you want to live your life, with the support you need to make that happen. Ehtookoto provides more services on the campus and in the community than I have space to describe here. The atmosphere and smiles among staff and residents alike attest to the culture of the place. And, they have a resident circus.